Camden New Journal - News: Chestnuts coated in vinegar, varnish and vindaloo – what a smashing day out for the kings and queens of conkers! Chestnuts coated in vinegar, varnish and vindaloo – what a smashing day out for the kings and queens of conkers! 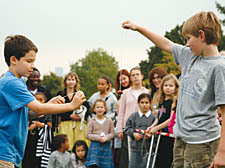 THERE was not a health and safety spoiler in sight at the annual Hampstead Heath conker championships on Sunday. Wiley competitors resorted to the usual Just Williamesque skulduggery – dousing their prize weapons in vinegar, painting them with varnish and baking them in the oven to steal a march on their rivals. The competitive spirit may have got the better of some people, with whispers of one imaginative player throwing out all known hardening wisdom and dunking their conker in a chicken vindaloo. In the calm before the storm, visitors enjoyed a two-hour educational walk across the Heath to learn about its ancient oak trees and conservation strategies before the most English of traditions kicked off at Parliament Hill bandstand at 3pm. Players were divided into five age categories – under five, five to eight, nine to 12, 13 to 16 and adults – before jousting in the ferocious knock-out competition. Five battle-hardened players thwacked themselves to victory, earning the coveted title of conker king or queen.